For an island so small in size Malta has an immensely rich cultural heritage – one that goes back all of seven thousand years in fact. Malta’s earliest inhabitants probably made the crossing from Sicily around 5000 B.C. and soon established an independent culture distinct from other Mediterranean ones. This culture reached its peak from around 3800 B.C. to 2500 B.C. with a fantastic outburst of artistic activity that produced the world’s first free standing monuments and an array of beautiful and mysterious statuary as well as accomplished pottery and decorative motifs and a unique underground burial complex. It is difficult not to be overwhelmed when visiting Megalithic Malta’s major sites; Hagar Qim, Mnajdra, Tarxien in Malta and Ggantija on the island of Gozo are the major remaining temple complexes, while the Hal Saflieni Hypogeum is a unique burial place – an intricate underground replica of a temple complex hewn out of the soft limestone rock. 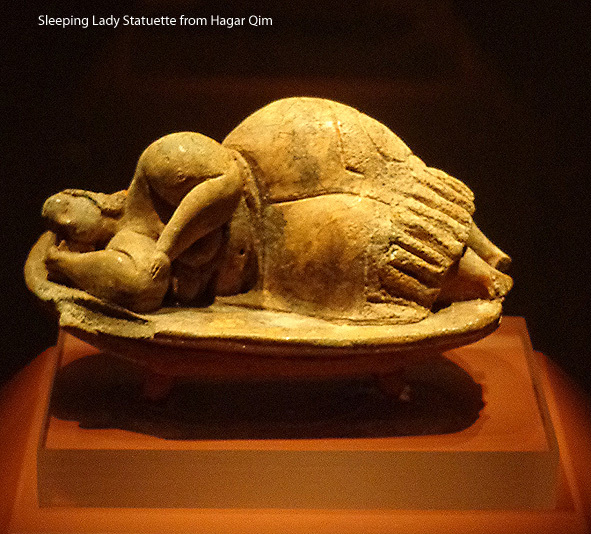 Equally important for some understanding and appreciation of the Megalithic culture is a visit to the National Archaeology Museum in Valletta – where not only the best finds are preserved but where the presentation helps in shedding some light on this remote but fascinating period. Mysteriously this civilization appears to have been wiped out completely before 2000 B.C. It was replaced by Bronze Age settlers more keen on occupying and strengthening easily defended hilltops than artistic achievement. The artefacts that remain from this era are few but nonetheless intriguing; dolmens, strangely stylized ceramic figurines and the earliest metal implements recorded on the islands. The Phoenicians, a remarkable seafaring and trading people, were probably attracted to Malta by its fine harbours and when they eventually founded Carthage in what is known as the Punic period Malta became a satellite of the latter. A huge number of tombs and other artifacts from this era still exist – some incredibly still being discovered to this day. 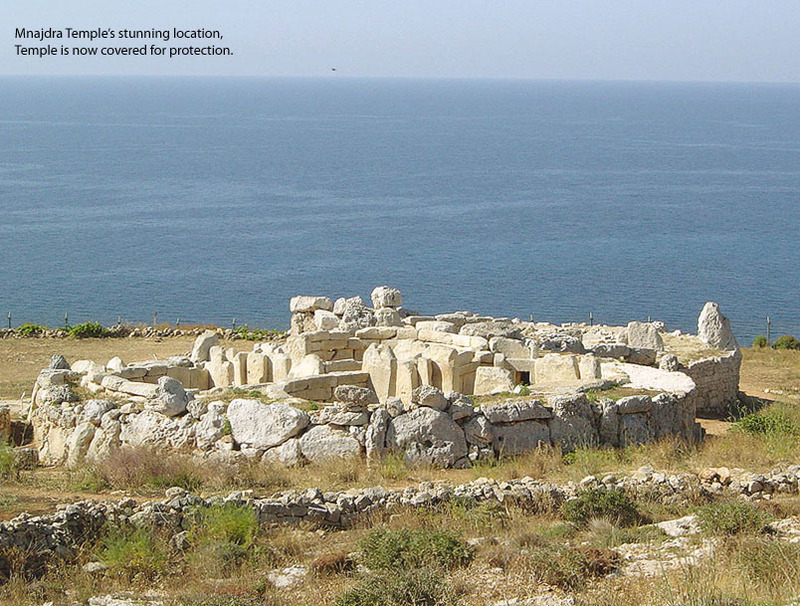 The Romans took control of Malta around 218 B.C. and their main settlement was Melite - modern-day Rabat – the Roman Domus has the best remains from this era with beautiful mosaics, jewellery and statuary. A good number of minor Roman sites also dot the islands. Christianity was introduced to the Islands when Saint Paul was reputedly shipwrecked here in 60 A.D. on his way to Rome to stand trial. A series of large catacombs dating from the fourth century – mostly located in Rabat – is the primary relic from this era. The Islands were overrun by Moslem forces around the year 870 and a long period of stagnation and dereliction seems to have followed until Count Roger reclaimed the islands for Christianity in 1090. The little art that has remained from this period obviously betrays considerable Sicilian as well as Byzantine influences – best exemplified in the impressive retable depicting the life of Saint Paul from the old Mdina Cathedral and now housed in its museum. Malta became firmly entrenched in the European mainstream with the coming of the Knights of Saint John in 1530. The Knights attracted to their ranks an array of noblemen from Europe’s foremost families, bringing with them wealth and the resulting architectural and artistic patronage. After the Great Siege of 1565, when the Knights finally decided to make Malta their permanent home, a vast building program was initiated; the city of Valletta was built in a relatively short period, miles of bastions were put up around the harbour areas and protective towers made their appearance all along Malta’s coast. It can easily be said that the Knights built the foundation for modern Malta and their huge influence on the urban landscape remains to this day. The artistic patronage of the Knights era reaches its peak in their most important building – the Co-Cathedral of Saint John’s in Valletta. 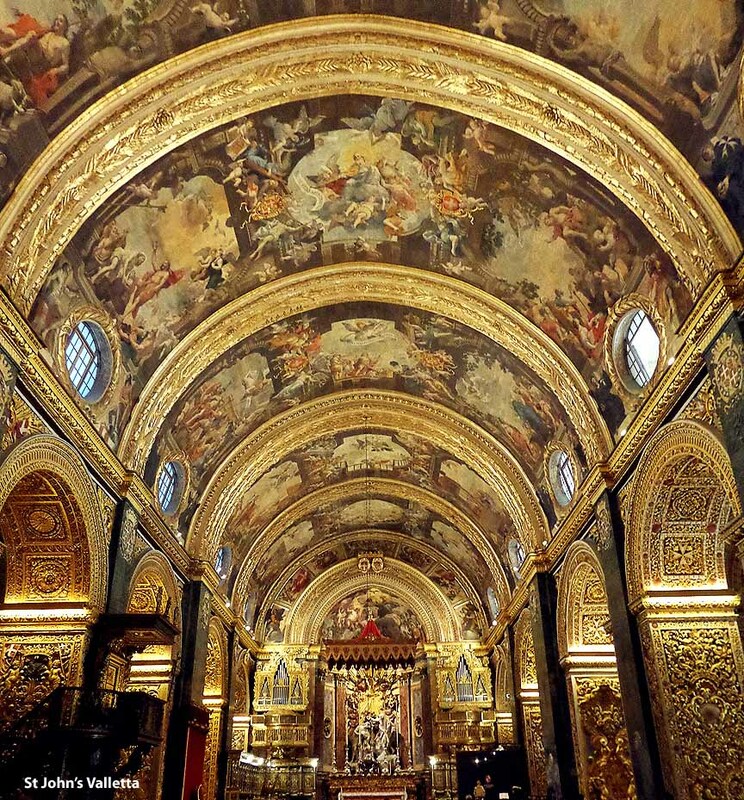 No expense was spared to make this Malta’s, and indeed one of the world’s, most sumptuously decorated churches. For the painting of the nave ceiling the Knights engaged the renowned Calabrian artist Mattia Preti who eventually settled here and introduced the metaphor of high baroque to the islands. No less worthy a contribution to this church are the two paintings by Caravaggio who lived briefly in Malta while trying to evade justice in mainland Italy. His “Beheading of Saint John the Baptist” is undoubtedly his greatest work and the only one of his oeuvre that he actually signed. Simultaneously with the Knights period runs the great era of church building in Malta where nearly every town and village built its own church and richly decorated it. Most of these churches are Baroque stylistically, with the best examples being the Cathedral at Mdina and the parish church of Saint Helen’s in Birkirkara - although artistic achievement, beauty and wealth of décor are certainly not restricted to the two examples here; indeed, the parish churches of Malta form an essential part of the islands’ rich tapestry of cultural heritage and most are worth at least a short visit. The era of the Knights ended in 1798, when the Order meekly capitulated to Napoleon Bonaparte. After a brief and turbulent two-year interlude of French rule the islands passed into the hands of the British – who obviously appreciated their strategic importance in relation to their strong Mediterranean presence. The century and a half of British rule left its imprint in some stylishly colonnaded buildings in a neo-classical style with Valletta’s elegant Anglican Cathedral being among the best surviving examples; the more ornate Royal Opera House falling victim to German bombs in WWII. The neo-Gothic style popular in Britain at this time was also felt in Malta, with prime examples being the monumental cemeteries of Ta Braxia in Pieta and the Addolorata Cemetery in Paola – the latter quite a masterpiece in the use of the existing topography. 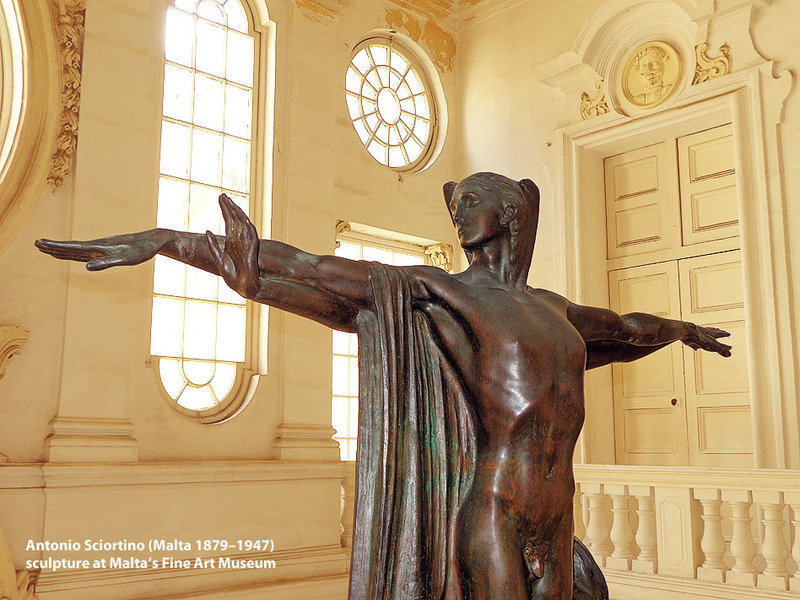 Twentieth century Malta has seen artists and architects embracing the modern idiom, with the sculptor Antonio Sciortino (1879-1947) managing to make a name for himself both locally and abroad. Local architect Richard England looked to Malta’s prehistory for inspiration, with his parish church at Manikata remaining his most iconic building – echoing the forms of Malta’s ancient temples and celebrating a culture marking ancient man’s first places of worship on the islands. Tenor Joseph Calleja is currently Malta’s finest artistic export. Having played the world’s most prestigious opera houses and made numerous recordings, Calleja still finds the time to return home to perform at an annual concert on the Granaries in Floriana. The on going regeneration of Valletta, spurred on by the city’s being chosen as the European City of Culture for 2018, has seen the redesign of the city’s main entrance by the renowned architect Renzo Piano – a project due for completion in late 2014. By 2018 the city will also have its museum of contemporary art, thus addressing a much-felt vacuum in the islands’ continuing cultural development. Find out more about some of the museums in Malta & Gozo.